Restrung the D/N shades in the LR and have gotten them reinstalled and everything but having a lot of trouble figuring out the trick to the wrap up knob that holds them and sets the tension on the strings. What's the trick to getting them all snugged up so I can tighten them. They're all loosey goosey and I'm having a devil of a time. The restringing had me add too much extra length I think as the tails are 3-4 feet long at the wrapping knobs. Shades are 59" wide, use 4 strings, and cover windows that are 24" tall. Any tricks for this final step in a repair? Links to videos? A document that spells it out? I can't really tell you how to properly calculate the appropriate amount of string for a repair. I bought a 3,000' roll of it off ebay and really don't care how much I waste if I incorrectly calculate the amount. As for the method of adjustment. There are a couple of ways those adjustment knobs are made so, it's going to depend on your model of knobs. On mine, I install the newly strung units but, I do it with a loop of string around each end, about 8" - 10" inches in from the end, that does not allow for the blinds to fall very far from the top. Then, the strings are attached to the knobs on each side, with tails hanging further down. Now, my initial adjustment is such that, I loosen the Phillips screw, just enough for the center barrel to come out, to expose the four micro-sized pins, totally. When they're totally exposed, the center barrel will rotate, along with the strings, to tighten them up. Then, re-insert the four pins and tighten the screw. You tighten them up just snuggle. Tight but, not guitar string tight. That will give you the initial setting and, you'll be able to determine from that point, whether to keep tightening or, loosen them up some, depending on how hard each section of the blinds is to move, up or down. If they're fairly hard, then you simply loosen the Phillips screw, back off the barrel by one pin setting, then re-insert the pins/barrel. And, whatever you do for one side, do the same adjustment on the other side. Hope this helps some. Plenty of videos on YouTube! Great video, and pretty cool way of cinching up the slack, but my knobs are not like that. My knobs are clear plastic that I thread the cord through, over/under, so it's kind of tight and doesn't move much. Than to adjust tension, I'm suppose to loop (or unloop) the cord around the body of the knob. But that video gives me some ideas that might work. I'll try it tomorrow. Is it possible for you to take a closeup picture of your knobs that your string wraps around? While I'm certainly no expert on this stuff, It's hard for me to believe that you have wrap or un-wrap the cord manually on any of the available adjustment knobs for day-night shades. Yes, there are different kinds with different methods of adjustment, just like what's on the video. But, there's got to be an easier way than what you're describing. Not saying your wrong, just wondering if maybe there's something you're not seeing. On edit: Jim, I just cruised through a couple of other videos of blind repair and, one has the same white plastic adjustment knobs as the video link above and, another one has clear plastic ones that you're supposed to run the two strings through, one on each side of a horseshoe shaped inner barrel then, sort of clamp the strings with an outside piece. Is that kind of how yours is? Take a look at this video and zoom close to the end to see how the strings are ran through the adjustment knobs to compare to yours. I have figured it out...and it was kind of dumb on my part. 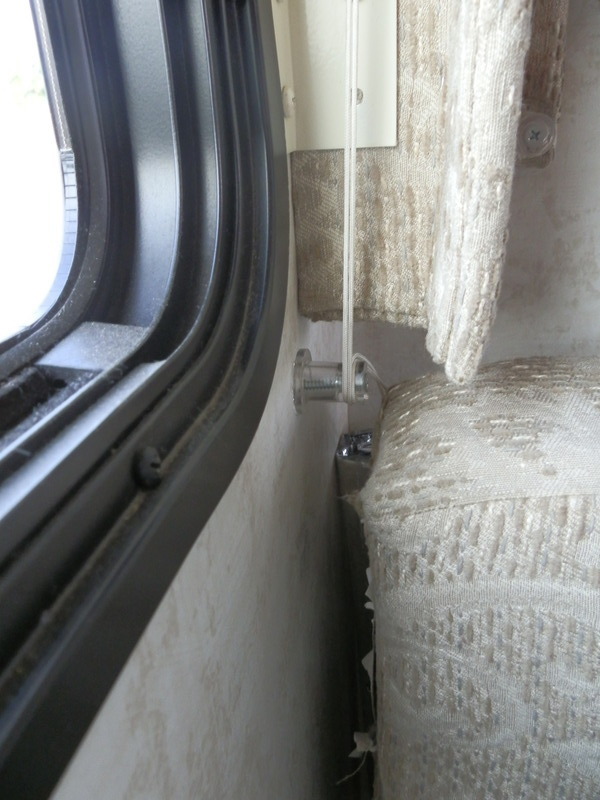 All you have to do is lash the shade at the top of the window, loosely drape the cord down to the tensioner which is what I call those clear plastic knobs screwed into the wall under the window, loosely screw the tensioner in place allowing for it to be rotated. You'll be turning the tensioners CCW on the right side of the window, and CW on the left. Than just rotate the tensioners to get the cords taunt. Hold them for a second while you tighten the screws and they are fixed in place...as long as the cords are over/under captured in the small holes provided. There are small knobs molded into the bases of the plastic tensioners and when they are tightened down with the screw, they don't turn because they've been compressed into the wall. Thanks very much for answering me with the pic. I see now how your system tensions the strings. Mine look very similar to yours only, they're two pieces with "pins" molded into the outer piece. You loosen the center screw just enough to be able to pull out on the outer section, the one with the strings attached and, four small pins. When the pins clear the main body, you rotate the outer part, tightening or loosening, whatever you need to do, and re-insert the four pined outer piece. Then, re-tighten the outer screw. Almost like yours but, two pieces per tensioner and, the four pins don't allow the string to pull back on the barrel. Thanks again.